Its arriving across the nation this week! Did you get your special box today?!? If NOT - don't scroll down!!! SPOILER ALERT!! :-) See the video showing March 2014's kit at the bottom of this post. R E A D Y to go! Just think . . . Right to your door each month, perfect for a little crafty break! 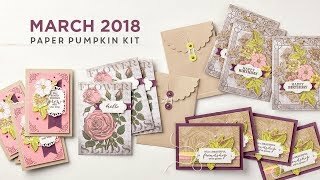 Everything is ready to go - no setting up, searching for supplies or testing color combinations, finding the right stamp set... You'll love what you find on the inside: All the stamps, ink, paper, and accessories to create Pinable projects in a snap. Stuff like cards, 3-D items, and more! Every month a different adventure! One of the great things about Paper Pumpkin is that the membership is flexible. If you want to get multiple kits for a group craft session, just adjust your quantity by the 10th of the month. Or, life getting too hectic? You can skip a month, suspend while your on vacation, or cancel your membership at anytime. Just click this link to go right to the Paper Pumpkin website and sign up: Join Now! 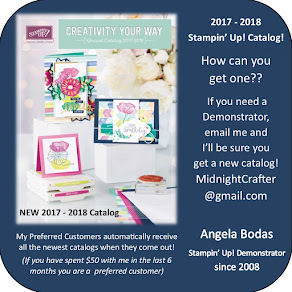 and be sure to tell them Angela Bodas is your Demonstrator! 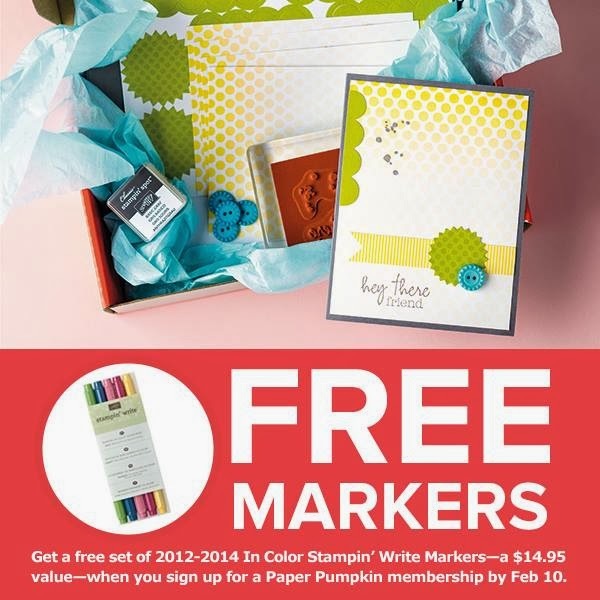 will receive a FREE set of 2012-2014 In Color Stampin' Write Markers -a $14.95 value-with their Welcome Kit. More information can be found on THIS PAGE. Sign Up for your own subscription today, you can get the bonus offer until the end of March!